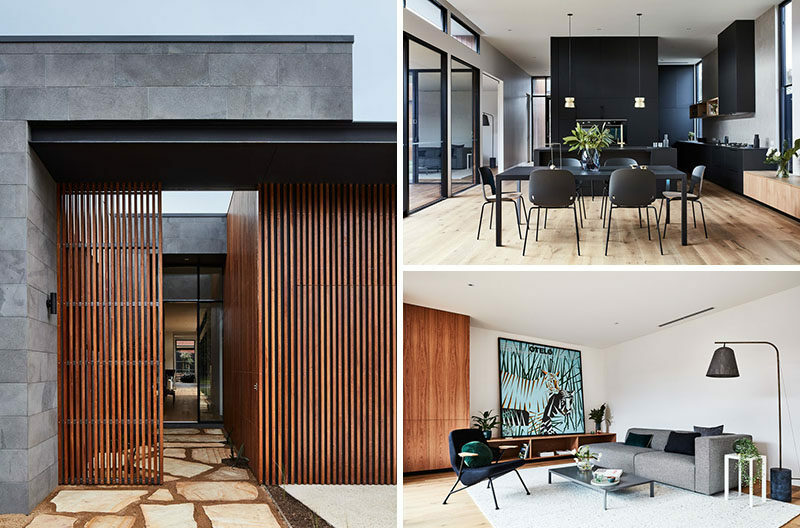 LifeSpaces Group, a building company, have worked together with Auhaus Architecture, to design and build a new house in Barwon Heads, Australia. 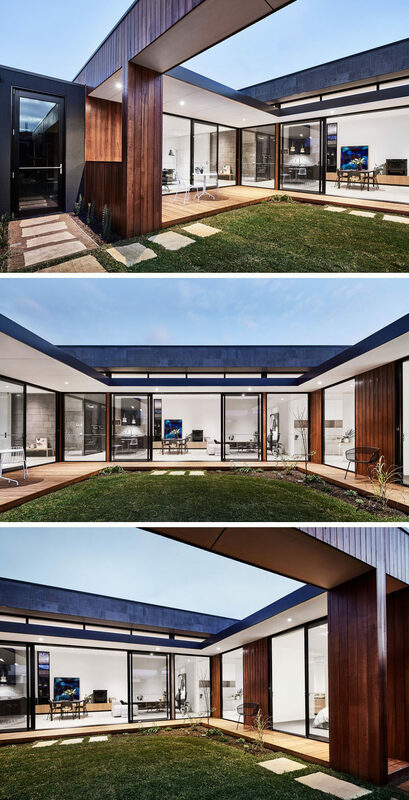 The house has a facade of horizontal bluestone slabs and vertical natural hardwood. 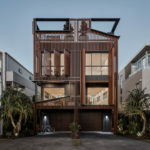 The front door to the home blends in with the vertical wood slats, creating a modern exterior. 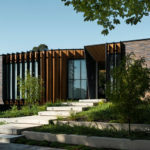 Stepping into the home, you become aware that the house wraps around an internal courtyard, while oak flooring adds a warm touch to the stone and black elements. A matte black kitchen with minimal hardware makes a statement against the white walls, while brass fittings add a touch of glamour. 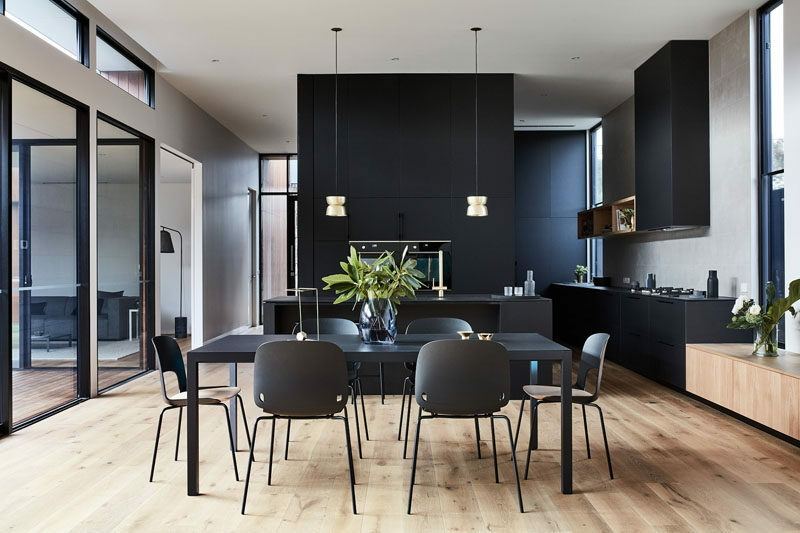 Next to the kitchen is the dining area with matte black furniture to match the kitchen. Beside the dining room is the living room. Large artwork draws your eye to the wall, while a rug anchors the furniture in the open space. 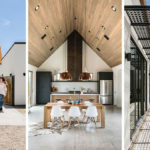 Each of the living areas of the home as well as one of the bedrooms opens up to the courtyard. 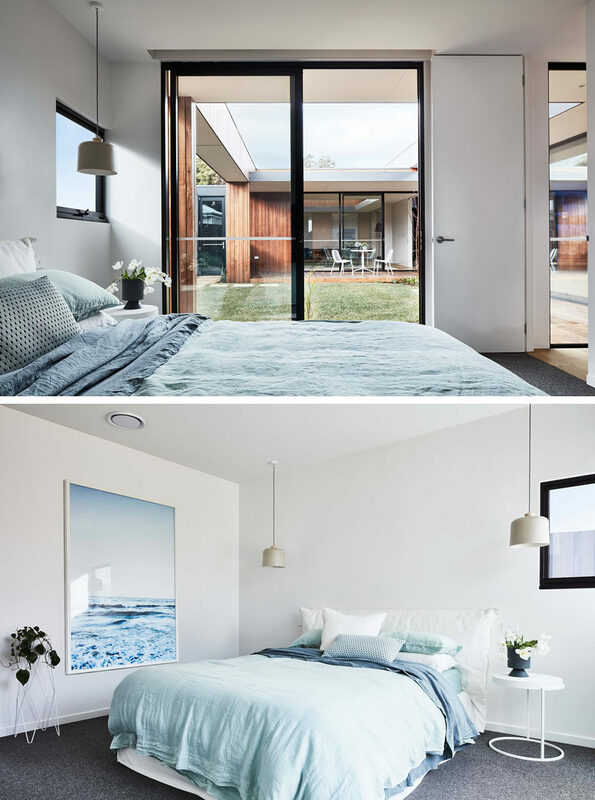 In the bedroom, light blue accents create a calm and relaxing environment, while the sliding door and a window provide plenty of natural light. 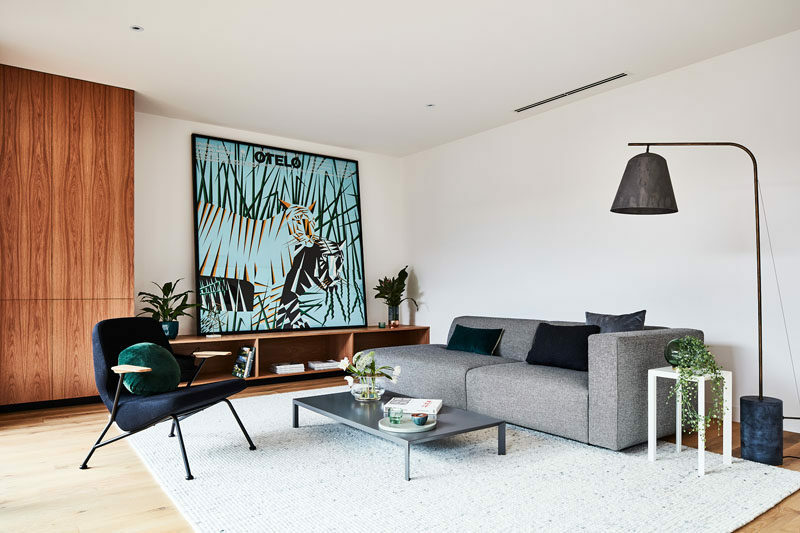 The home also has a second living space, again, a large piece of artwork draws the eye and adds a pop of color to the room. White minimalist cabinets line the wall in the home office, while the black desk complements the black window frames and artwork. There’s also a second home office (or homework station) that’s been tucked into a hallway. It has a long wood desk and open wood shelving, and next to the window is a small library area with a bookcase. The color palette used throughout the house of wood, white and black, can also be found in one of the bathrooms. 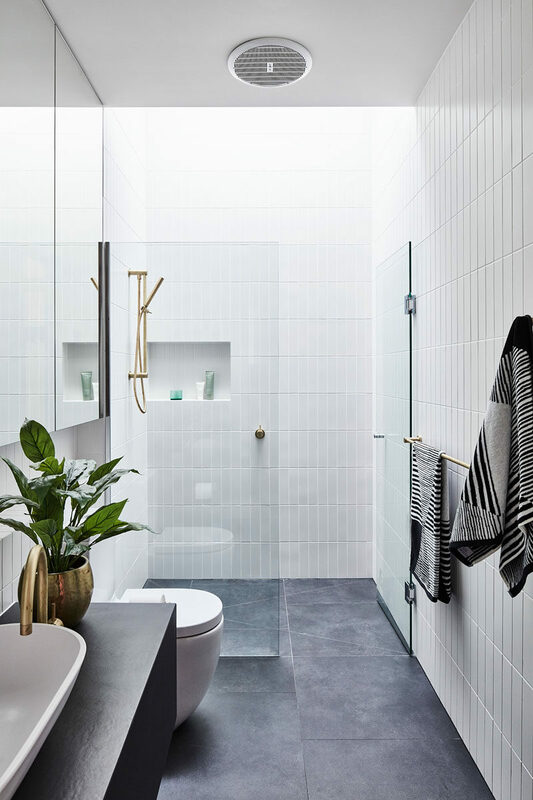 The black flooring and vanity contrast the white freestanding bathtub and accent tile wall, while the wood cabinets and a plant add a natural element. In another bathroom, floor-to-ceiling white tiles cover the walls, while a skylight adds natural light to the space.